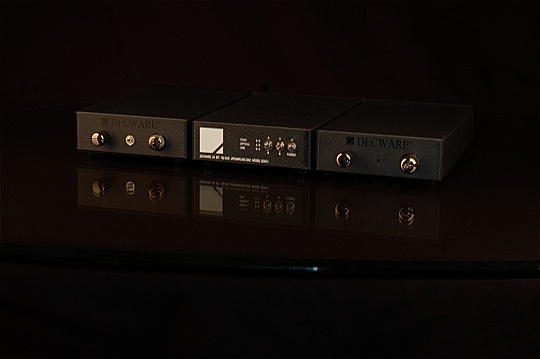 At the 2009 Decware Zen Fest, I demo'd my reference battery driven NOS dac with promises to make something that sounds that good for under a grand... this Summer we launched the ZDAC-1. Despite my reference dac having a selectable tube stage and selectable solid state buffer stage, the ZDAC-1 with no tubes and no batteries is in the same league. NOW, with the success of ZDAC-1 sales and no returns via the 30 day trial, I've taken the next step and developed the matching tube gain stage for the ZDAC-1. And since both of these products match our very popular ZBOX, the trifecta is complete and in the predicted order! With all three matching peices, the ZDAC-1, ZSTAGE and ZBOX as a final buffer it is possible to get a very similar experience to what I demo'd with my reference last year, and for around half the total cost. Now, I've been listening to the ZDAC-1 by itself directly feeding various systems since January in place of my well loved reference dac. My theory was that if it wasn't damn close to what I had, I wouldn't make it more than 30 days before going completely nuts. Well I've made it 8 months to date and my reference is gathering dust except for an occasional A/B session. The reason I mention this is because a tube stage is not required to get great sound and dynamics from the ZDAC-1. That said, if you want elevate the ZDAC-1 to another sonic plateau, I have created a gain stage for it that has been carefully voiced to be magical together. Transparency of the ZSTAGE is reference grade so there are no tradeoffs. Adding this stage simply allows you to dial in the "hit" and flush the music out in the open. It makes everything sound better. SO, I'm excited to be bringing this new product into our line, not just for what it will do with the ZDAC-1, but probably any solid state dac as well. I also know that for purists looking for a straight forward preamp this will be a VERY attractive alternative to purchasing our CSP2+ preamp. I'll know the price by the Zen Fest in October if not sooner. As you can see, it has a straight signal path from the jacks to the tube. There is a bias switch on the front that works exactly like the one on our Zen Triode amplifier. It lets you change the dynamic envelope on the fly. One way is laid back and the other brings out the weight and punch in music. It looks deceptively simple, but 12 hours later this first ZSTAGE has 7 nodes from input to output jack, starved filament technology to reduce the effects of odd order distortion, a separate audio ground that makes the units on either end see only a single interconnect (no chassis), reduced voltages for increased tube life, and no heat, no hum, no hiss and no noise even with high gain amplifiers. Uses NOS 5963 dual triode with no global feedback. So, I look forward to letting everyone hear the ZDAC-1 , ZSTAGE & ZBOX trio in any combination at this years fest! In that our friend Lon is on the road with his motorcycle I'll suggest that one of the first production units be reserved for him. 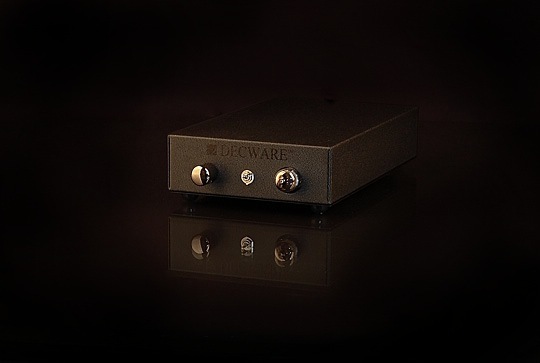 This product sounds like the perfect compliment for the Decware DAC. Am looking forward to listening to the combination at the upcoming Decfest. But maybe in time I'll get one, we'll see, and try it with all sources in tandem with the ZDAC. Probably would have to sell one of my spare Decware amps, ZCD, maybe RL2s when I get my ERRs, etc. Very happy with the system as I have it now. Congrats Steve, looks like a great linestage! I'm sure it will be a success. Pretty amazing that one can get so much of Steve's "reference" DAC design at half the price. Exciting news for audiophiles! OK, I've been trying not to like it... trying multitudes of different scenarios and I think I've succeeded in achieving my goal - which was... super transparency. Almost too transparent, however being as I love the sound of the ZDAC-1 straight up, I didn't want to take anything away. The ZSTAGE has no trade-offs that can be found without a microscope. What it does to the signature is subtle, but just that bit of tube goodness we all crave. Being able to roll tubes is paramount to the serious listeners... changing output stage OP AMPS in the ZDAC-1 as some have asked, is not something I want to get into. I don't recommend it, I've explored all possibilities and don't want it to ever be changed. The ZSTAGE makes it possible to have your own way with the signature which I think will be much enjoyed by those who try it. For those who aren't yet familiar with it, the ZSTAGE is a straight in-out gain stage with a variable output based on a 5963 dual triode. It was done with a purist mind set, with the least number of nodes, and makes a dandy preamp for those extreme purists using only one source. The reason to add one to a ZDAC-1 is two fold. A) you can taylor signature and imaging via some tube rolling. B) Control of frequency balance and dynamics. For example, say you listen to the ZDAC-1 and a recording comes on that sounds too quiet. You can turn the ZSTAGE up a bit and bang, the dynamics appear out of nowhere. OR, say a recording sounds to thin... You turn your amp (or preamp) down a couple notches and crank the ZSTAGE up a few. Bang, you have weight. OR, say a recording is too fat. Do the opposite. Problem solved. Oh, and as a special bonus, some of you will be familiar with the most excellent bias switch on the Zen Triode amplifiers... you flip it while listening to the music and it changes the bias of the tube. One way is super clean and ultra holographic, the other way is more forward and dynamic with more bass weight. Like having two different amplifiers... I have included this exact feature on the ZSTAGE. It's like having a little nitrous button on your source... brings out the torque in a recording. A very nice feature. This is accomplished by adding a ZBOX to the output of the ZSTAGE. Since the ZBOX has it's own gain control, you have multi-demensional control of dynamics as explained above but with an underlying level of control. Why add a ZBOX to the picture? A) If you listen to 16bit 44khz red-book CD's or digital recordings it will restore much of the underlying harmonics that were eliminated by the bit depth of only 16 bits. B) If you listen to MP3's or AAC, or anything downloaded from ITUNES store, etc., internet radio as well... it's a God send to have a ZBOX. Fools you into thinking you've got a real hi-end thing happening with these somewhat pitiful formats. If you listen to 24/96 formats or higher, or use a good vinyl rig, then the only possible reason to use a ZBOX is if you have a long cable run, or a preamp/amp with a really low input impedance of say 20K or less. The ZBOX will restore the weight and correct the high frequency roll off due to it's low output impedance. OR if you have a system that after everything else due to room acoustics or strident speakers like lowthers and you just want more richness and bloom, less fatique then add a ZBOX. These can be stacked on top of each other, or side by side as shown. Each piece is 6 inches wide and 11 inches deep. All three will fit in most racks. I will also be offering super short interconnects designed for this trio - allowing you to set the units side by side or one atop the other. This takes all the worry about what cables to use out of the experience. I have everything in stock to build these units in a timely manner... so if anyone wants to get on the build sheet early before I get the web page completed, just call us, or e-mail me zen@decware.com. I can ship early people on the list before it becomes available on the site, which will be soon. The input and output jacks are floating with a common ground that feeds a straight copper 14 gauge wire going to the tube socket. This is the ground buss... the negative side of your signal path. The power supply filter caps and the virtual center tap from the fast recovery diode bridge is located in the center of the ground buss. 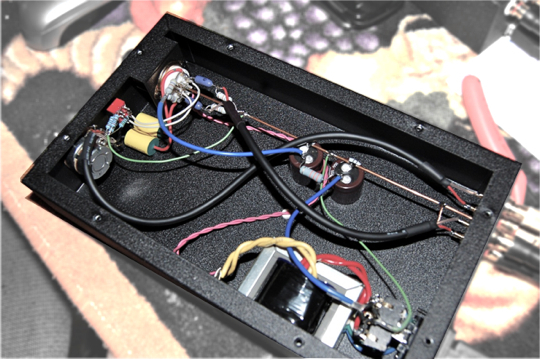 The steel chassis acts only as an RF and Magnetic shield as the whole audio circuit floats within. I'm using .47uf 400V Auricaps because I like the signature they have in this unit, at these voltages and with most NOS 5963 tubes... not to mention the flexible stranded copper leads which are constant with the copper used throughout the signal path. The circuit, believe it or not is basically identical to the front end of a Zen Triode amplifier, but using 12 volt tubes instead of the 6922 used in the Zen Triode. There are some differences, the voltage is far lower, and the heaters are starved so that the unit has undetectable odd order harmonic distortion (often associated with solid state sound) and increased even order harmonics at some 60dB down. It's a little ZBOX magic in a gain stage vs. a buffer stage like the ZBOX. The Page is done for the ZSTAGE. There isn't a support forum for it yet. I wanted to see how it would do as a gain device to boost the input voltage to my TABOO. I use it as a gain especially for DVDS with the caveat of magnified background hums when the ZSTAGE is way up and the amp is way up. They don't show up much until I really crank both though. And the balancing of the amp/ZSTAGE volume nobs while retaining the same relative output volume is a really great tool for tailoring the sound. That said, with the right tube and cables, I would guess you could weigh on the transparent side so that working with the ZSTAGE nob averaging on the up side for added gain could work very well. I find quite a notable difference with tube-type gain. The 5157 I use is louder, but can be a bit too in your face with my already powerful Torri MKIII for some stuff while the 12AU7 types with their lower gain allow more gain potential from turning up the ZSTAGE nob without excess push. For me the RCA 12AT7 grey plate I have, which has a pretty high gain, sounds sweet even when turned up. But who knows, with just the right 12AX7, giving the most gain, you might get a good sound. All that aside, there is a fair bit of gain potential from the unit using the stock 12AU7 type tube. Heres a little update: I just did a listening test to get a sense of the gain potential of the ZSTAGE with the ZDAC1 in front. I don't have a Db meter but can offer some subjective opinion. Playing "Kind of Blue" with my Torii MkIII set at about 1/3 volume and the ZSTAGE (with the stock tube) at 12 o'clock through MG944s I get decent sound, but it is too quiet for my listening enjoyment. Turning up the ZSTAGE to 3 o'clock, it is quite loud enough for my moderate normal listening level. With the ZSTAGE turned up all the way it is too loud...it hurts just a little. Looking at it another way, I started with the Torii MkIII at 1/3 and the ZSTAGE full volume then gradually turned up the MkIII all the way while turning down the ZSTAGE trying to keep the volume the same as much as I could. The MkIII all the way up with the ZSTAGE a bit above 11 o'clock was a similar volume as the MkIII at 1/3 and the ZSTAGE full volume. Sorry for being so arbitrary, but hope this helps. The bottom line... the ZSTAGE has a lot of gain and with this CD sounds pretty damned good fully cranked. But with a recording with more weight, like Patricia Barber "Touch of Trash" from "Modern Cool" the ZSTAGE on full has too much body and weight for my tastes and with this tube. But the MkIII has a lot of body to start with. With my amp, I generally like to run the ZSTAGE between about 12 and 3 o'clock. Seems like it is usually around 1 or 2. Why would you want or need the ZStage with the Tori? The tube stage is empowered by the gain, the gain allowing me to add or reduce weight, body, focus, dynamics and so forth depending on the recording. Then there is the tonal flexibility with different tubes and the bias switch. And even though the Torii is powerful I use it for movies too and there are DVDs that are so quiet that I benefit from the gain of the ZSTAGE. It is really about the way it makes my already great system greater sound-wise though. Please read my review of the ZSTAGE and I think it will probably answer your questions.